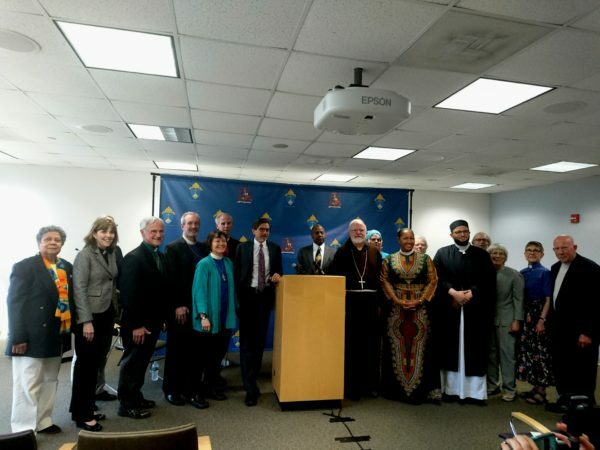 [Episcopal News Service] Bishop Alan Gates of the Episcopal Diocese of Massachusetts and Bishop Doug Fisher of the Episcopal Diocese of Western Massachusetts joined Cardinal Seán O’Malley of the Archdiocese of Boston and other local faith leaders and scientists on May 23 for the release of a joint appeal for action on climate change. The release of the joint appeal is a significant first step in an extraordinary, even unprecedented, alliance between religion and science. Initiated by Phil Duffy, president of the Woods Hole Research Center, who reached out to O’Malley, this emerging coalition of faith leaders and scientists intends to give a robust push to the effort of preserving a livable planet. Another religious leader who attended the May 23 press conference stepped forward to offer a few impromptu, impassioned remarks. The Rev. Jim Antal, who leads the Massachusetts Conference, United Church of Christ (and who, with Fisher, oversees my ecumenical appointment as missioner for creation care), pointed out that religious communities have plenty of room for improvement when it comes to raising awareness about the urgency of stabilizing our planetary climate. How often do we preach about climate change? How often do we give our congregations opportunities to learn climate science and to discuss the issue from a religious and spiritual perspective? He cited the latest research from the Yale Program on Climate Communication (“Climate Change and the American Mind: March 2018”), which shows that although 70 percent of Americans understand that climate change is real and largely caused by human activities, 65 percent of Americans never talk about it. And only 13 percent consider climate change to be a religious issue. Now that the joint appeal has been issued, members of our emerging coalition of faith and science are meeting May 30 to discuss next steps. I view this initiative as strong encouragement to Episcopal congregations to learn about climate science, to engage in conversations about climate change as a moral and spiritual concern, and to take effective action. In order to protect “our common home” and to break our dependence on fossil fuels, Americans need both head and heart. Facts and reason alone will not motivate us to change course; we also need stories, prayer, and ceremonies, the power of imagination and a vision of hope. Together with scientists, we can speak with one voice about the sacredness of God’s Creation and the moral imperative to protect it. — The Rev. Dr. Margaret Bullitt-Jonas serves as missioner for creation care, Episcopal Diocese of Western Massachusetts and Massachusetts Conference, United Church of Christ. She maintains a website: RevivingCreation.org. Bravissimo!!! We absolutely must move beyond the inertia and willful ignorance that keeps our politicians from acting. We have the know-how, the means, the technology, the imagination to solve this problem!! It’s time we revived the can-do confidence of the Post-War era to move ahead and solve these problems quickly! A little history may be helpful here. Previous glaciaton covered a strip across Washington, Idaho, Montana, most of North and South Dakota, a strip down eastern Nebraska, all of Minnesota, Wisconsin, Iowa, Illinois, Indiana, northern Ohio, all of New York and New England. Most of this glaciation existed only 10,000 years ago. It all disappeared before Al Gore and the Episcopal Church were on the scene to preserve it. All the result of NATURAL, albeit complicated, causes of climate change. It seems somehow presumptuous to now claim that we have the know-how and technology to interfere with this process in any meaningful way. The millions of dollars now being spent and to be spent supporting the climate change industry could actually be used to improve the lives of millions around the world. It’s presumptuous to believe we have know how and technology now that we didn’t have 10,000 years ago?Are you serious ? I am no scientist, but like the Secretary of Defense, General Mathis, I believe that global warming is real. This is despite the false threat of an impending ice age reported by scientists in the 1970’s, and the Climate-Gate Scandal that revealed some scientists were “cooking their data” to support the global warming theory for their own research funding purposes. Addressing climate change should not be a political or even a religious debate—it is a national security and quality of life issue. When Religious Leaders claim that climate change as a “moral and spiritual concern,” they risk watering down the science and can make its proponents sound more like religious zealots than knowledgeable thinkers. The appeal should be to common ground, rather than demonizing or belittling those who are not passionate believers that climate change is an imminent threat. Whether we believe in climate change or not, most of us, liberal and conservative, can agree that clean, renewable energy sources improve air and water quality, reduce pollution, and promote our national security by reducing dependence upon foreign oil and unregulated power sources that have to be built on the other side of our borders. Mandating arbitrary green house reductions that may be economically punitive will not work. In 2009, the Episcopal Church adopted the “Genesis Covenant,” an admirable and progressive promise to reduce the carbon footprint of all Church facilities by 50% within 10 years. Members were asked to sign on to a similar personal commitment to reduce their personal carbon footprint by 50%. How has the Genesis Covenant been working out? I have not seen ENS or the Leadership issue a progress report card on its success with the deadline only 1 year away. How many churches now have solar panels? How many church leaders use planes and combustion engine automobiles (fossil fuels) to travel to their political action committee meetings and conventions? The reality is that artificial “reductions” in use of fossil fuels are meaningless if not based upon economic feasibility. The conversation needs to be joined by leading economists and industry leaders—scientists can identify the problem, politicians can pontificate, and religious leaders can pray, but thank God we also have industry leaders and financial institutions who are the doer’s and financiers of actual solutions. Make “Going Green” profitable, and we will create jobs here in America rather than destroy them. Provide land grants and tax waivers to companies who manufacture “green” products when they locate in the cities within the “rust belt” or other depressed areas. Incentivize investments in renewable energy with tax breaks and government subsidies. Build more dams as well as solar plants. Solar power plants may not be feasible in cold climate States, and the “inconvenient truth” is that hydroelectric power, although damaging to nature in the area where a dam is constructed, is a clean, renewable, dependable and efficient source of electrical power when compared to the alternatives of nuclear power generators and fossil fuel power plants. Electric cars are only low-carbon if the electricity sources that charge them are also low carbon. Let capitalization work. ” We….must move beyond….the willful ignorance ….that keeps our politicians from acting..”. Earth-to-Nick Wyman: President Trump has thankfully pulled the US out of the Paris Climate Accords. “Missioner for Creation Care” ? Who came up with that one ? Why don’t Commander Curry and his minions concentrate less on protesting Trump, the vapid Paris Climate Accords and more on saving souls – much like all the African bishops have done; the very same evangelical African bishops who have lost fellow Christians in their midst killed as a direct result (spoken by the muslims in their midst) of ECUSA LGBT views. The best solution involving the African bishops,particularly Nigeria and Uganda,who have supported government positions calling for imprisonment and execution of LGBTI people ,and who are actively working to promote schism in the Provinces they don’t agree with is to EXPEL them from the Anglican Communion. I am stunned by all the egotistical,Politically Negative Uninformed reactions to this article!Contrary to these offensively critical comments,I believe it is wonderful for Ecumenical Leaders to recognize the path our Government Administrative” leaders” have taken to endanger Lives and Natural Resources for personal financial gain!Please do your research on contaminated water supplies!Highly toxic chemicals have been identified in public water supplies from NY to West Virginia.Hvae you learned of the water problems in Baltimore?Are you aware of the chemicals employed in “Fracking”,let alone the millions of gallons of water utilized?Water is NOT in unlimited supply.Look at Northern California..City water supplies contamination from a byproduct of Teflon production!The township west of LA with air contaminated by toxic gases !Rural areas where gas is flowing from water faucets!Are you aware of the deletion of EPA regulations by this Administration?Well Water does NOT guarantee safe drinking water!.I Admire and congratulate these” Ecumenical” Leaders for having the Intelligence and Courage to join together and Speak Up to save Lives as well as Souls..Bravo Massachusetts!By the way,Many years ago as I was travelling through Massachusetts,I was amazed at the number of homes with Solar panels on their rooves along the highway. Please do your research before taking a stand of being Hypercritical of Uniting Clerics and other Informed Individuals.What are You doing to Protect Natural Resources and Quality of Human Life? The one point you are missing is that, unlike many in the ECUSA hierarchy, the African bishops are real evangelical Christians. I find it highly unlikely they are promoting a “schism”. – The ECUSA has already caused a schism – much like the Boy Scouts leadership are doing in the US. Tucker Carlsen stated today that the Boy Scouts are simply following the lead of the ECUSA.